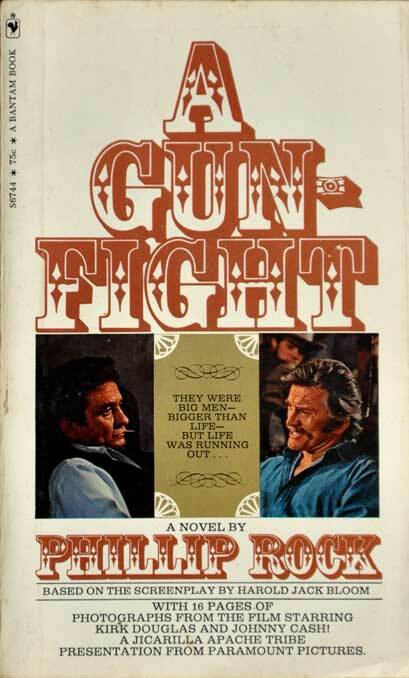 A novelization of the movie of the same name. 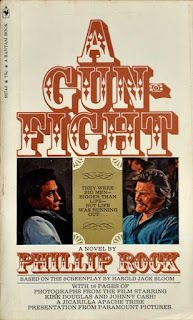 Will Tenneray and Abe Cross, a pair of famous but aging and down on their luck gunslingers, agree to stage a gunfight in a bullfighting ring, with the ticket proceeds going to the winner. Tenneray has a conversation with his young son Bud, who tells of how folks in town talk about the time Tenneray outdrew the Ringo Kid. The Kid was John Wayne's character from the classic Western Stagecoach, which was brought into the CU by my buddy John Allen Small's story "Buck Mason Loses His Horse." Ringo is also mentioned in Herne the Hunter #5: Apache Squaw by John J. McLaglen, which also contains references to George G. Gilman's series character Edge (who is already in) and Nathan Brittles, Wayne's character from the film She Wore a Yellow Ribbon. I'd forgotten about the Heme The Hunter/Edge connection to the Ringo Kid. Kudos!! It's also good to know so many John Ford/John Wayne movies are in. So there are two distinct old west figures called the Ringo Kid (Wayne's character and the guy who's crossed over with Rawhide Kid)?